Fantastic adventures and terrifying monsters await the team of heroes as they journey through space and time in this latest instalment of the globally-renowned drama. Expect laughter, danger and exhilarating escapades in this final series. Two worlds collide when the Doctor meets Bill. A chance encounter with a girl with a star in her eye leads to a terrifying chase across time and space. Bill's mind is opened to a universe that is bigger and more exciting than she could possibly have imagined. But who is the Doctor, and what is his secret mission on Earth? London, 1814. The entire city has turned out for the biggest Frost Fair in decades! But beneath the frozen Thames, revellers are disappearing, snatched through the ice. Pulled into the depths where a terrifying monster lurks. Will the Doctor and Bill stop the slaughter before they too are dragged into the icy waters? Why do floorboards creak? When a sinister landlord shows Bill and her friends the perfect house-share, they have no idea what lies ahead... Knock knock, who's there? Space - the final frontier. Final because it wants to kill us.' 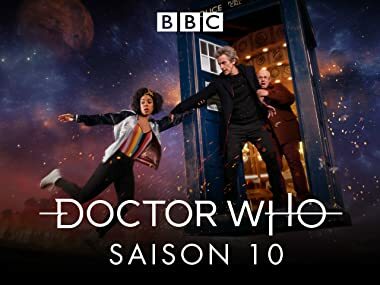 Trapped on a space station with no oxygen, the Doctor, Bill and Nardole are horrified to discover the automated spacesuits keeping them alive are also trying to kill them! The Veritas. The truth. Truth so true you can't live with it. Is that looking into hell... or seeing the light?' Everyone who has ever read the Veritas has been found dead. In a forbidden library at the heart of the Vatican, the pope urges the Doctor to read the ancient text - but can he handle the truth? An 'ancient' pyramid appears overnight. Every clock in the world begins counting down to the Earth's destruction. Three opposing armies lie ready to annihilate each other. An alien race stands ready to offer humanity a deal that could save them, but also enslave them. It's a terrifying race against time to save the world. Will the Doctor be forced to accept their help? God save the Queen' has been scrawled on the surface of Mars. What are Victorians doing on the home of the Ice Warriors? And what will they find beneath the Martian soil? A huge spaceship trapped in the gravity well of a black hole, teeming with impossible lifeforms, harbours one of the Doctor's most feared enemies… Mondasian Cybermen! The Doctor makes a final stand against an army of Cybermen, to protect a tiny band of humans from destruction. Two Doctors stranded in a forbidding snowscape, refusing to face regeneration. A British army captain, seemingly destined to die in the First World War but taken from the trenches to play his part in the Doctor's story. In the final chapter of the twelfth Doctor's epic adventure, he must face his past to decide his future.